Written by Kelsey Marchand on 25 March 2014 .
Business Dashboards, not unlike those found in cars, provide feedback and real-time insight into the metrics and numbers most relevant to you. It’d be difficult to drive a car without knowing how fast you’re going, or plan a road trip without knowing how much fuel is in the tank. Business dashboards hold the same importance for companies. 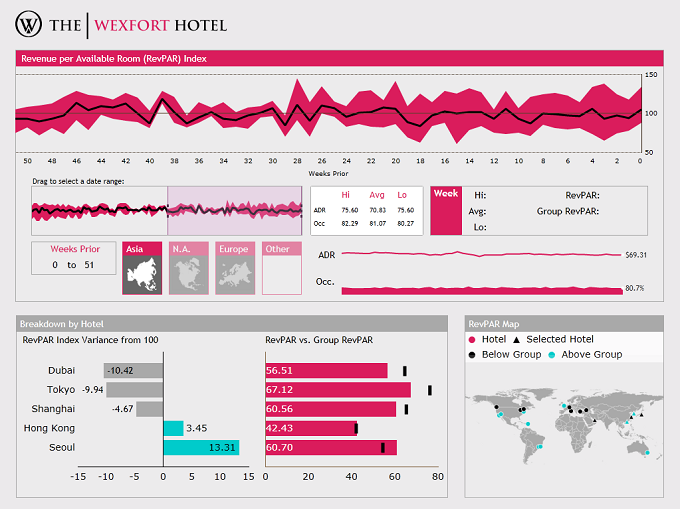 Why use a dashboard and not just a bunch of individual charts or graphs? Dashboards aren’t just one generic chart, or graph, or gauge; they can be tailored to fit any department or person's needs, which means that they are able to provide stronger, and more insight. Perhaps the finance department needs to monitor several KPIs in several graphs; by using dashboards, all the information is presented on one board and organized in a format easily readable to its specific users. Having the important data in sight means you don't need to dig for the key numbers in pages and pages of monthly reporting. Dashboards also automate routine reporting and create more time for analysis, increasing the efficiency of your workday. Real-time display of your KPIs allows you to easily spot what's working and what isn't, allowing you to address any concerns before they become problems. Not only can performance be tracked, by other pieces of data too, which can allow you to not only notice, but act upon opportunities you may not have found in a monthly report. Centralizing your data in a dashboard allows you to make all the key pieces of data available to all stakeholders, which encourages collaboration within and across departments. Another benefit to centralizing your data? It helps refocus company culture through consistent measurement, and agreed-upon results. Dashboards go beyond being a one-stop-shop display. They are a high level summary of your business that allow you to easily spot trends, problems, and opportunities. They provide a host of business benefits just by allowing the right people to see the right information in real-time.